Flying Eye Books, 9781909263833, 80pp. William Grill recently graduated from University College Falmouth and currently works in London as a freelance illustrator. He works in predominately in coloured pencil, and has worked for a variety of clients such as Harrods, The New York Times, Shelter and NOBROW. William draws most of his inspiration from looking closely at what's around him, and from a young age has maintained a keen interest in dogs and the outdoors. A powerful, cinematic work of naturalistic fiction that deftly outlines the importance of respecting nature. Grill has created a powerful picture book that is certain to provoke feelings of empathy for the regal Lobo and Blanca. Breathtaking illustrated pages [...] Mr. Grill uses colored pencils and perspective pulled well back—to reveal men and animals as vanishingly small when set against the beautiful vastness of the natural world. A magnificent large-scale picture book, The Wolves of Currumpaw gives narrative non-fiction a new dimension. […] The story is deeply moving, and Grill ends by linking Seton’s tale to the history of conservation of wildlife and its great importance today. 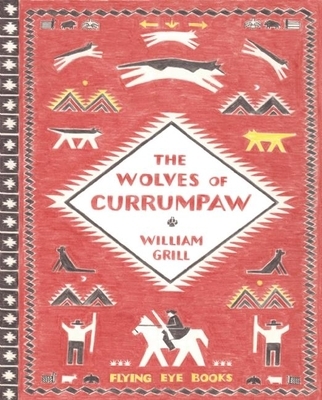 William Grill brilliantly evokes a landscape inhabited by wolves in his narrative non-fiction The Wolves of Currumpaw. An artful, thought-provoking adaptation sure to inspire budding conservationists. The winner of the 2015 Kate Greenaway Medal offers an atmospheric retelling of a 19th-century tale that helped to spark the wildlife conservation movement in this country. […] the illustrations convey an intensity of feeling in keeping with the profound way the experience changed at least one man’s life. a story both disquieting and redemptive, emblematic of the era’s problematic relationship with the natural world and central to the evolution of the wildlife conservation movement over the century that followed it. […] an essential reminder that we can’t reasonably judge one era by the moral standards of another; that, above all, so many of our ethical principles have emerged from the disquietude of their opposite — a sentiment echoed in the contrast between Grill’s soft, sensitive illustrations and the brutality of the killings, both by the wolves and of the wolves. Based on Seton’s book, Wild Animals I Have Known, this children’s storybook is educational and appealing for young ones and the adults who will enjoy reading it with them. […] The Wolves of Currumpaw will surely charm readers as Lobo charmed Seton. Beautifully illustrated […] Grill’s stunning colored pencil drawings enhance and extend his modern retelling of Seton’s drama, Lobo, the King of Currumpaw, originally published in 1898. Like William Grill’s other picture book, Shackleton’s Journey, Wolves is beautifully illustrated on thick textured paper with colored pencils. Wolves [...] is powerful, told as much by Grill’s narrative as it is by his illustrations. [...] I look forward to seeing what he brings us next. In his follow-up to the beautiful Shackleton's Journey, William Grill and his colored pencils tackle the story of Lobo king wolf of the Currumpaw valley and the men who tried to hunt him in the 1880's. The text is compassionate yet honest about the events, telling the reader what happened and why it was harmful. But, being William Grill, it's the dream-like art that shines in his burning red brown deserts and sweeping blue skies. It might have felt like an age since a new project by Grill (though it's only been two years) but Wolves is worth every moment of that wait. This is a lovely book which is sure to win many hearts. What makes this book brilliant – a bar-smasher – is the way Grill has blended and merged different genres to create something that is uniquely his own. Fact and fiction, word and picture become one. It’s a book full of wisdom – it is beyond categorisation and beyond compare.